Simpson Rally is the latest in open face helmet design. The adjustable earmuffs deliver a soundproof environment for ultimate communication. The Simpson Rally Sport is our latest development in open face helmet design. The adjustable peak offers protection from the blinding sun. Additional sunscreen visor can be installed. The Rally Sport Helmet is FIA 8859-2015 certified. 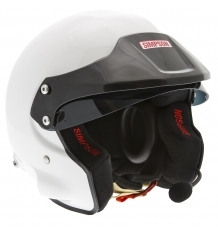 Simpson Race Products have been in the motorsport safety business since 1959. It all began with brake chutes for drag-cars. 1967 was Simpson the first company to manufacture Nomex fire suits for racing. Since then have Simpson developed more than 200 innovative products for motorsports safety and become one of the leading brand in the World. 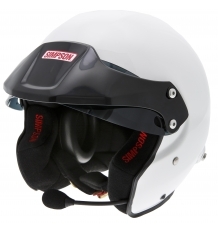 Simpson have for many years been the leading supplier of safety equipment to the most challenging motorsports in the world, sports like Drag Racing, Nascar and IndyCars. Simpson design, develop and manufacture their products inside USA. Simpson Europe is the European Master Warehouse Distributor for Simpson Race Products.